When I wrote my essay "10 1/2 Things I Hate About Starbucks" a few weeks ago, I promised I would follow up with a series highlighting independent coffeeshops in Shanghai and other cities I visit. Since then, I've had time to frequent a number of such establishments but I haven't gotten around to posting any photos or reviews. So today I would like to kick off the series with a short description of LP Cafe, at 1399 Huashan Road. LP Cafe is across from a park in between Huaihai Road to the south and Yan'an Road to the north. It is very close to Shanghai Jiaotong University and about a 15 minute walk north of the Xujiahui metro station on Line 1. The LP Cafe is a small place but I found the atmosphere there to be homey and pleasant. You can view the wall decorations in the photos for this post. Some of the coffee prices are a bit on the high side (20 rmb for a single espresso, 48 rmb for an Irish coffee); others are priced about average (30 rmb for a mocha). Of the two drinks I ordered, I preferred the mocha (just right) to the cappuccino (too milky). My girlfriend went for a lemonade black tea. The reading material on hand in the coffeeshop was a mixture of architecture books and glossy magazines. I read the current issue of Yunnan Magazine, which is hands down the best English-language magazine I have a come across in China, both for its stellar photography and for its in-depth hard-to-obtain information. I don't subscribe to magazines anymore, but if there was a China-based magazine I felt was worth a paid subscription, this would be it. A few pictures of the coffeeshop are provided below. St. Sophia Cathedral contains a impressive array of old photographs and is well worth a visit. 1) The McDonald's Effect. By being everywhere, they are nowhere. Every Starbucks has the same stale design, the same stale menu choices, the same corny logo. Hell, they even have Drive-Thru. 2) Paint It Green. Dollar sign green. Nothing original on these walls. Starbucks refuses to support local artists with space, even though they have plenty of it at their 16,000 locations. When was the last time you saw a local artist or photographer's work featured at your neighborhood Starbucks? I have visited Starbucks in countless cities and several countries and never seen anything but corporate artwork on the walls. By contrast, independent coffeeshops regularly display local artwork. This is a great disservice to their customers, many of who would love to skim over a free publication or glance at event listings while they sit down to a cup of Joe. Curiously, Starbucks outlets in China have magazine racks- but they only stock them with a handful of obscure fashion, if that. Perhaps they have a marketing arrangement with the publisher? They’re not stocking them because they’re the most sought after items. Meanwhile, Starbucks branches on the U.S. side only display publications they can sell for cash, e.g., metropolitan dailies or The New York Times. For me, this policy highlights Starbucks' overriding emphasis on the bottom line vs. customer service. If it doesn’t contribute to their coffers, it’s not worth doing. 4) Dead in the Evening. When was the last time you saw a poetry reading, an acoustic night, a photo club meeting, a lecture, a film showing, or any other community gathering at a Starbucks location? Take a look at these listings on the Starbucks website for last Saturday in New York City. Nada. Who knows, maybe they’re just bad at updating their website. Keep in mind that Starbucks has at least 171 locations in Manhattan alone. Starbucks isn’t only a poor host, they also have an early bedtime. Independent coffeeshops are often open till midnight. Starbucks branches close much earlier. When I was in Seattle last summer, we walked down a downtown street, looking for the original Starbucks branch (which we were told was in the area). We found a Starbucks alright, closed. At 6:45 pm. 5) Wireless Zone. Starbucks corporate headquarters apparently hasn't heard about the internet age yet. They don't offer free wi-fi. Now I know there is some kind of complicated arrangement whereby if you buy a $15 or $25 Starbucks card purchased in the U.S. or Canada, and keep reusing it every month, and agree to receive regular spam from AT&T (yes, this is an actual part of the agreement), and curl your hair a few times, yadayadayada, you can (maybe) get wi-fi access for up to two hours, at locations where wi-fi is offered. Sorry, this doesn't cut it. If you're in a shop that charges $5.30 for a green tea frappuccino, free wi-fi should be a given. Pretty much every other coffeeshop in the world now manages to provide this access. In my mind, Starbucks makes its access complicated for only one reason: corporate HQ doesn't want computer users taking up space in the store. They want you to get your coffee and leave. 6) The Parrot Effect. Starbucks employees are (apparently) required to greet hello and call out farewell to every customer as the enter and leave the store. This is humiliating to employees- and as a customer I find it unsettling to have some one call out "Thank you and please come again," or whatever every single time I walk out the store. Starbucks is fortunate to have very courteous and friendly employees in China. The company should let employees focus on what is needed- making coffee and serving customers- hell even chit-chatting with them, I am fine with that. But please quit demeaning them by forcing them to be mechanical announcers. 7) Pee in a Cup. Who would build a shop that serves 20 oz. caffeinated drinks to dozens or hundreds of customers a day and not provide a restroom? Starbucks. Starbucks coffeeshops in China virtually never have a bathroom. In major American cities (where they wouldn't dare leave out a bathroom entirely), Starbucks often keeps the restrooms locked, forcing customers to line up at the cash register in order to obtain a key from an already-harried barista. They need a new slogan: if you give us your money for coffee, we’ll let you pee in the cup. 9) The Incredibly Leaky Coffee Cup. Takeaway cups at Starbucks leak through the lid. Not some of the time. In my experience, it's pretty damn near all the time. No one wants coffee sloshed on his/her shirt or lap. Say you're a corporate manager in the coffee business… How difficult is it do design a to-go cup that doesn't leak? I don't encounter this problem much at other cafes. 10) Play tables. Starbucks's round chessboard tables are small and easy to pack into a room en masse- and also annoying if you're trying to juggle a cup of coffee, a croissant and a book, magazine or laptop on a table only made for balancing a cup of coffee. 10.5) Godzilla on Mount Java. 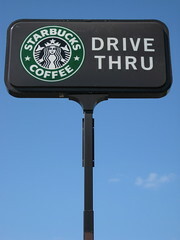 Starbucks takes up places in the market that would be better served by local coffeeshops. Some would argue that this is not true, offering Starbucks’ heavy promotion of coffee culture and the expansion of coffee outlets as evidence that the chain is actually good for independent businesses. I don't buy it. There are now six Starbucks locations within a 15-minute walk from my house (along with five other chain coffeeshops). There used to be an independent place outside my house, a nice coffeeshop with books on the shelves, an on-site owner, and occasional community events. It closed down. Do you expect me to believe that this total market saturation by chains- Starbucks especially- doesn't make it unlikely that an independent coffeeshop, without those massive corporate dollars behind it, will ever open in the same area? That sums up the complaints I wish to tally. Starbucks’ coffee isn’t bad, about average. It’s expensive, but any time your buying retail at a limited display in a prime location, the price is going to be high. I do wonder why they charge $3 for a teabag and hot water (21 RMB for a large tea) and never offer specials, but those aren’t major issues in my coffee life. I’ll leave it to others to chronicle varying lists of environmental and/or labor complaints about the company (some of which are meritorious, others of which are not). I’m not on a vendetta run. The issues that irk me are the ones I face every time I walk into a Starbucks: its utter detachment from culture, community, originality, and genuine customer respect. Now a disclaimer: My love of coffee exceeds my hatred of Starbucks, and given the ubiquity of Starbucks' presence in my neighborhood, I do find myself shopping there on occasion. Don’t read me the riot act if I’m on the run and you find a cup of Starbucks in my hand. Some of the complaints I have cited apply to other chain coffeeshops and not only Starbucks. But Starbucks is pretty unique in packaging together all of the downfalls of chains. I love coffee, Starbucks coffee included, but I hate the company philosophy (one oriented around bland conformity and faked idealism) that has given the chain a deserved McDonald’s label. I don’t plan to boycott Starbucks. It would only inconvenience my caffeine habit and do nothing to impact the company. But I do intend to continue the policy I’ve had up to this point: whenever possible, frequenting independent coffeeshops instead of Starbucks, even if it requires walking farther, or digging more into listings, or paying a slightly higher receipt (actually, some independents are cheaper). Furthermore, I’m planning to take on new efforts to champion independent and community coffeeshops. If you're looking for an independent coffeeshop in your area, you can start by checking these websites: Indie Coffee Shops, Cafe Hunt, or CosyCoffeeShops. Over the next few weeks, I’ll be adding regular entries to this blog about interesting coffeeshops across the Shanghai area. They will all be independents, unless I happen to find a chain location with essential features, such as a unique design and neighborly attitude (unlikely, but possible). (Btw, I didn’t get this idea from the recent coffeeshop feature in City Weekend, but from looking at another magazine last week: More Hangzhou, which carries coffeeshop listings more comprehensive than those found in the back of City Weekend). With this rant over, I’m open to new ideas- and another cup of coffee. Walking home today, on a block sandwiched between two Starbucks, I came across the Marco Polo Café. Peeking in through the doorway, it looked nice. Next time, I’ll stop over there. Hopefully, their cup won’t leak. The text of this article was published with an attributive, non-derivative Creative Commons license. In can be freely re-published elsewhere as long as attribution is provided to the author (Jeremy Breningstall) and this website, Breningstall.com. Nov. 30 update: Today I stumbled across a similar list by Thomas Hawk, albeit one with the opposite point of view. Since I'm a big believer in a diversity of voices, I'll link to his "10 Reasons Why As a Photographer I'm a Fan" (coincidentally, posted at almost the same time). With all due respects to Mr. Peterson, I stand by my original position. Here is a list of 400-plus other establishments that provide free wi-fi in Shanghai.